All materials published on CoffeeReview.com (including but not limited to reviews, ratings, tasting reports, articles, scoring medallions, and Top 30 medallions) are protected by copyright, and owned or controlled by The Coffee Review, LLC. Coffee Review content is intended for personal, non-commercial use. The commercial use of Coffee Review content by others is prohibited. Coffee Review generally permits roasters to quote from or cite their own reviews for informational and promotional purposes. 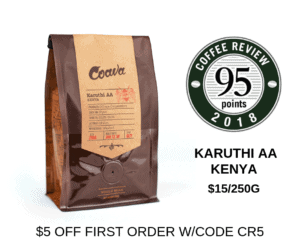 However, keep in mind, the primary purpose of displaying Coffee Review content and medallions should be to provide accurate, up-to-date, objective third-party information to assist consumers with their immediate purchasing decisions. Reviews, ratings, and medallions must not be altered. Reviews should not be selectively quoted in such a way as to change the accuracy or spirit of a review. Roasters should display the entire “blind assessment” or “bottom line” section rather than any single phrase or part. An ellipsis (i.e. “…”) should be used to indicate an intentional omission of content. Roasters must provide a link from citations on their website to the associated detailed review page on CoffeeReview.com so readers can conveniently access a complete review. All quotes or citations must include the date of a review because older reviews may no longer accurately reflect current versions of the same coffee. Quotes, citations, or scores of coffees reviewed over a year in the past should not be applied to current versions of the same coffee or blend. Coffee is a seasonal beverage. If roasters wish to cite reviews or scores that are more than 12 months old, they must explicitly state that the review and score are for a previous version of the same coffee. Reviews that are more than two years old are not considered up-to-date nor accurate and may not be used to directly merchandise a current version of the same coffee. We encourage roasters to resubmit the latest version of a regularly offered coffee for fresh review. Reduced fees may apply to commissioning a fresh review of a coffee that was reviewed in the past two years. Please do not apply ratings or reviews to other, similar but not identical coffees you offer for sale. Also, please do not reference Coffee Review ratings of identical green coffees roasted by other companies. Coffee Review scoring medallions may be displayed in association with the current version of a reviewed coffee. Medallions that are more than two years old are not considered up-to-date nor accurate and should not be used to directly merchandise a current version of the same coffee. We encourage roasters to resubmit the latest version of a regularly offered coffee for fresh review and an updated medallion. Reduced fees may apply to commissioning a fresh review of a coffee of the same name that was reviewed in the past two years. Coffee Review medallions may be applied as stickers to retail bags of coffee. However, stickers referencing coffees or blends that were reviewed over a year in the past should not be applied to current versions of the same coffee or blend. Coffee Review scoring medallions and Top 30 medallions may not be altered. This includes the indication of the year the medallion was earned. Roasters may not create original medallions or artwork that contain the Coffee Review name, logo, medallions, or rankings. If a roaster wishes to receive a digital version of a Coffee Review scoring medallion or Top 30 medallion, please email Kim@CoffeeReview.com or Ron@CoffeeReview.com.